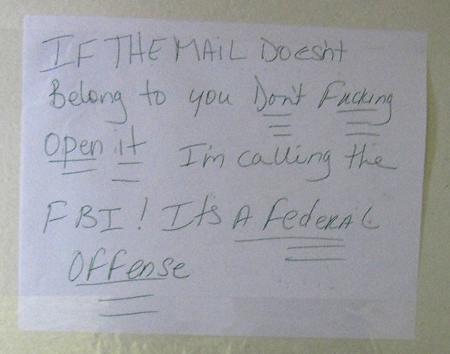 This gem comes from my apartment building. as far as miss delivery of mail, i can not make excuses but i can explain what is going on at the usps. as we all know after 1975 the usps stopped being a govt agency and became a semi private company. we do not receive any money from the us govt all our money is made on mail and packages. in the new post office, union employees are going bye bye, and we are being replaced with non-union temp help(with our unions blessing). these new employees do not have to meet standards of the federal employees.. and they main job is to get mail out and done as quickly as they can. they are told to deliver mail by apt # only, and if there is no apt#, mark it insufficient and send it back. no name, no reading of names, just numbers. Wow, I didn’t know all that. Having a temp deliver the mail sounds like a terrible idea. I have a tendency to give post office employees my sympathy because my grandpa delivered the same route for over 30 years. I guess those days are long gone now. So if my Netflix delivery is a day late, blame it on the temp who is likely watching my copy of Midnight Madness before me?